Harris inked a seven-day deal with the Sky on Wednesday, Andrej Joe Potric of The Score reports. Harris was only inked to a contract after the Sky were allowed a medical hardship roster exception, so her time with the team seems rather unlikely to extend beyond the seven days. She should serve as some bench depth for Chicago over the next week. Harris was waived by the Sky on Wednesday. 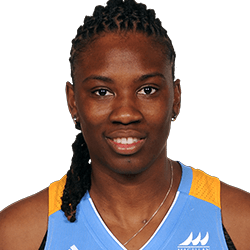 Harris, the former fourth-overall pick in the 2011 WNBA Draft, struggled to find a consistent role during her first campaign with the Sky last season. She averaged just 1.6 points and 1.6 rebounds across 5.9 minutes. Harris entered the All-Star break averaging 1.6 points and 1.4 rebounds across 4.9 minutes per game. Harris is in her first season with Chicago after spending the the previous three years in Minnesota. Despite the decline in talent on the roster, Harris still hasn't been unable to garner a significant role and has averaged just 4.9 minutes across 14 contests. That keeps her off the fantasy radar for the most part, although the Sky could opt to get her more minutes in the second half of the season if they continue to struggle. Harris is averaging just 4.9 minutes per game over her 13 appearances with the Sky this season. After four years away from the league, Harris has returned in limited fashion as added depth off the bench for Chicago. Assuming there aren't wholesale changes with the Sky, Harris should be considered a lackluster option in just about every format for the remainder of this season. Had 11 points and a season-high eight rebounds June 5. vs. Los Angeles.